New York, March 31, 2009 – Data through January 2009, released today by Standard & Poor’s for its S&P/Case-Shiller1 Home Price Indices, the leading measure of U.S. home prices, shows continued broad based declines in the prices of existing single family homes across the United States, with 13 of the 20 metro areas showing record rates of annual decline, and 14 reporting declines in excess of 10% versus January 2008. 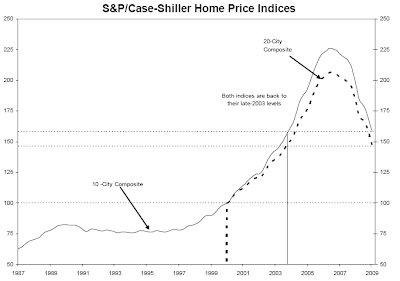 The chart above depicts the annual returns of the 10-City Composite and the 20-City Composite Home Price Indices. Following the lead of the 14 metro areas described above, the 10-City and 20-City Composites also set new records, with annual declines of 19.4% and 19.0%, respectively. 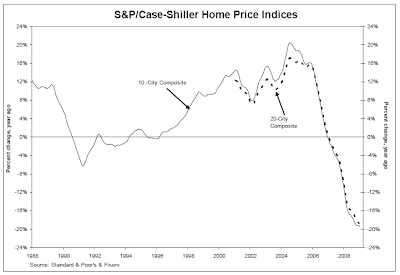 The chart above shows the index levels for the 10-City Composite and 20-City Composite Home Price Indices. As of January 2009, average home prices across the United States are at similar levels to what they were in late 2003. From the peak in the second quarter of 2006, the 10-City Composite is down 30.2% and the 20-City Composite is down 29.1%.